Completing the paperwork to buy the Church took almost a year. This gave us that valuable planning time, which enabled us to redraw, and then redraw (several times) the plans, and also not least to understand the church in three dimensions. This was far from easy as the Church is on a steep slope and is built into the hillside with narrow street access. The overall finished floor area is 200 square metres on three levels with four ensuite bedrooms. There were a couple of clear design principles internally which we fairly early decided upon. A ‘Victorian gothic style’ in full colour for the triple height ‘Chancel’ area (where the altar stood), contrasting with a ‘cool modern’, white basement area. ‘Mood boards’ which reflected this were created by Jackie and were more than helpful throughout the project. They ensured that the look and feel that we had set out with at the start was achieved and helped us to make the right decisions. It was important to us that whilst both areas were different in style, that they were equal in quality and design, so that the living experience would be consistently high throughout. 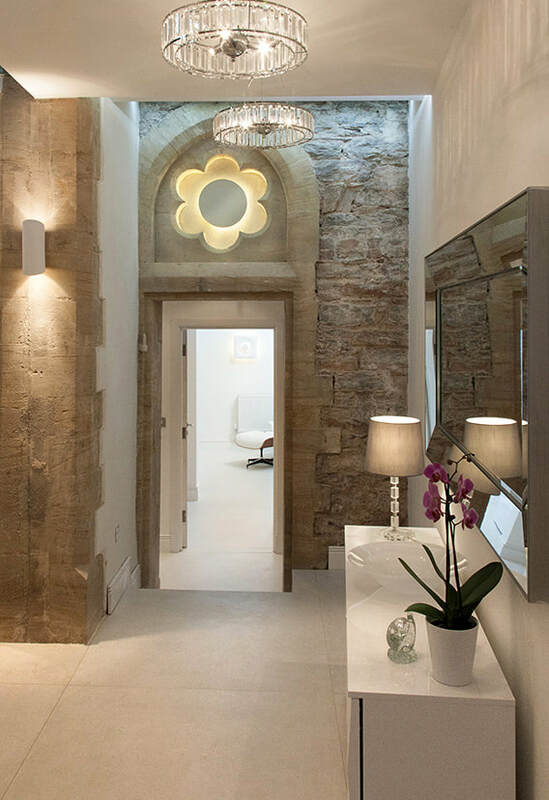 Whilst the Church had been stripped of many of its original features, we also wanted to make the most of the remaining original parts such as the natural limestone walls and the main boarded Church ceiling. One of the first tasks once the demolitions had finished was therefore to clean off and sandblast the existing stonework to reveal its original beauty. Great lighting to suit each area and special effects lighting to highlight key features were also important and this was one of the most complex areas to design and specify on the build. Introducing more natural light, the use of glass flooring, the restoration of the natural stone and use of strong Victorian colours and floor tiles were key points which contributed to creating a unique living space in the main Church chancel zone, which comprised the main living space and master bedroom below, originally a part of the church some 12 metres high. 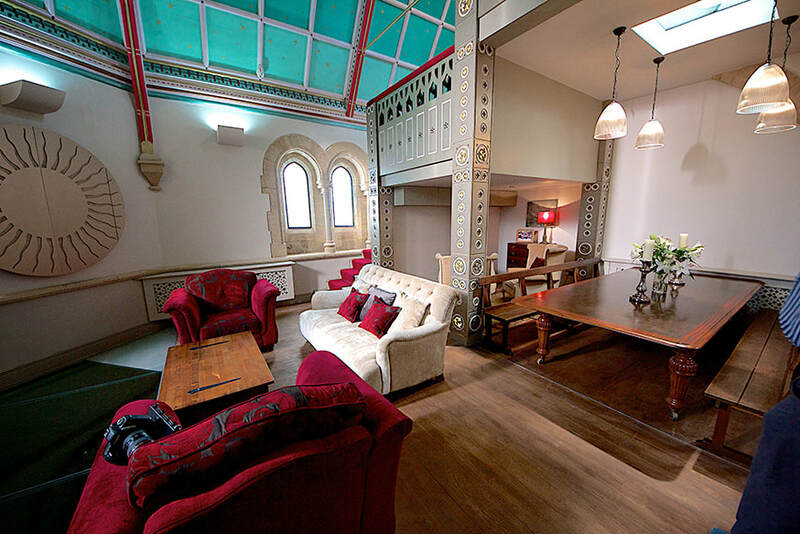 We built a new lounge floor just below the three large arched church windows. The lounge area comprises living room (next to the large plate glass floor), snug with fire, dining area, work zone and sky lounge. To one side the kitchen is located on a raised platform with fine views across Torbay. In the basement area, introducing more natural light, designing rooms with high ceilings and generally spacious proportions as well as ‘an all-white’ approach to the decoration and furnishings helped to create a modern, practical and comfortable series of living spaces. Early on in the build, we wanted to find more inspiration for the Victorian, colourful part of the church, so as well as using the existing church interior photos that we had (for the columns and wall designs for example) we also visited a building that had inspired Neil from his childhood, Castle Coch, just outside Cardiff. This was built by William Burgess in the 1880’s, although the design is very much a Victorian recreation of a medieval castle! We took inspiration from this for our metalwork, floor tiles, chandeliers and also for the overall colour, feel and atmosphere.